other day, and after prancing around in it all night I just had to have it. 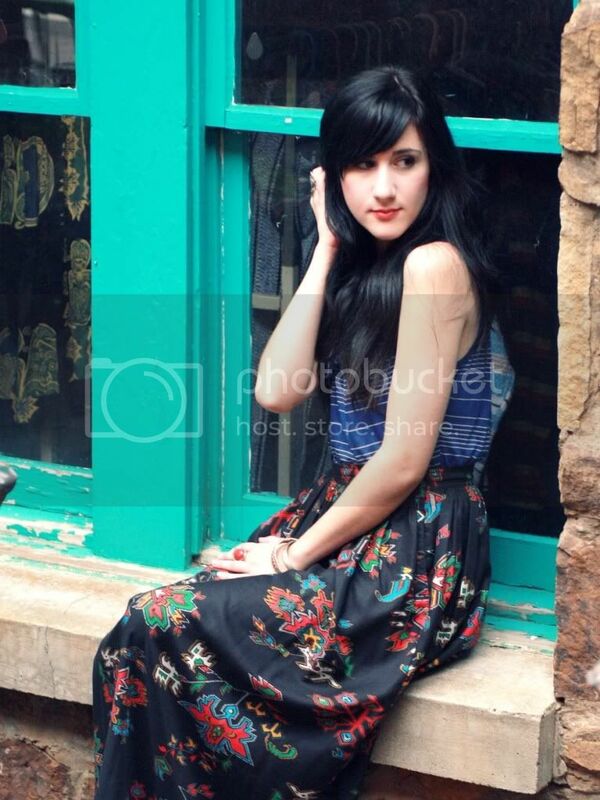 straight out of a Free People catalog. In other news, The Dalai Lama is coming to speak at my school TODAY!! I am so excited and totally ready to be astonished by his words of wisdom. This is such an amazing opportunity and I will be sure to fill you all in on it! très jolie cette tenue ! i love that shoes ..
these skirts suit you :) you look so tall with them! I absolutely adore this skirt too! The print is amazing, and I love how you mixed the patterns! It really works together! The cafe sounds so amazing! Love the skirt. A wonderful outfit. You are so beautiful. So amazing that you get to hear The Dalai Lama speak! Hope it goes well. I love the print on this skirt. I would have snatched it up too! 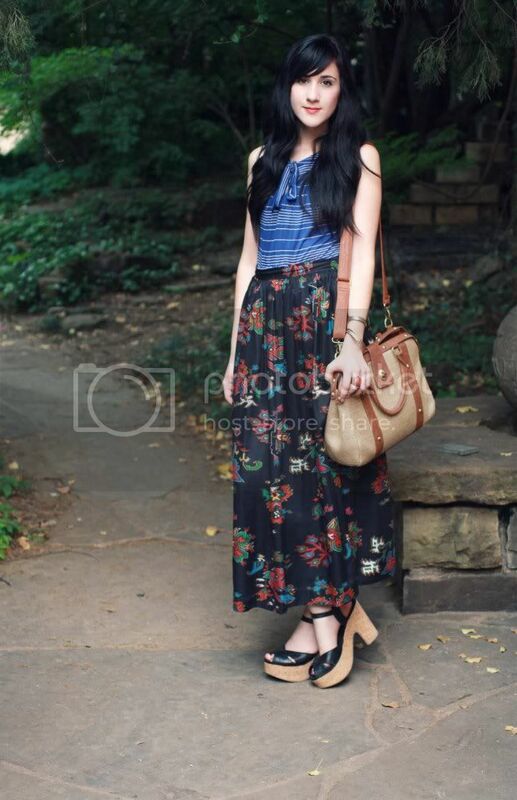 I'm in love with maxi skirts too! Great pattern mixing - and that's such exciting news about the talk, I love getting to hear guest speakers on campus! I LOVE THIS. I'm not used to seeing you in such bright colors but I love it!! That skirt is fantastic & I'm such a fan of mixing patterns. i love this skirt style now too, it is laid back but still nice enough to wear out or to a nice dinner :) and i love the blue striped shirt with that skirt, it pulls out the lovely blue color of the skirt! always gorgeous! You totally work it in maxi skirts, girl! You look beautiful in the print. That's so exicting, I saw that Dalai Lama was speaking there today (which is only less then a 2 hour drive from where I'm at) but alas, I have work. Hope you have a wondrous time hearing what he has to say! I always get so excited when I see you've posted. 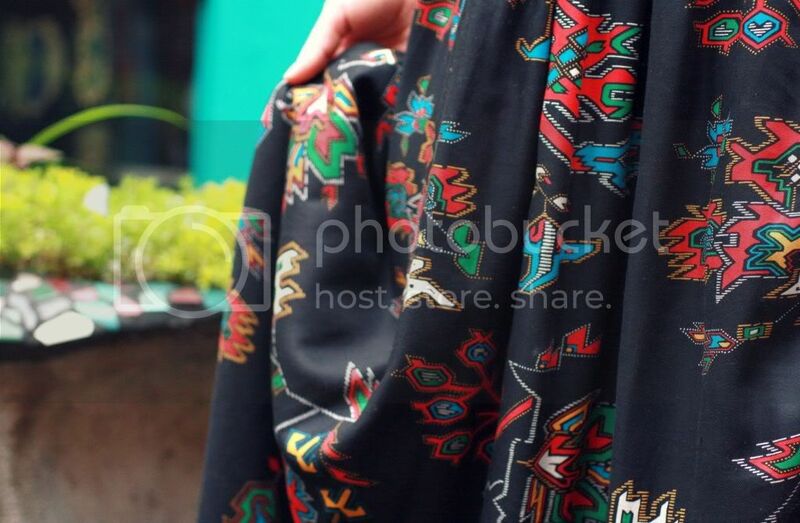 This tribal skirt is so pretty! It perfectly suits you and don't worry about all the maxis, I am just loving them! I really love that whole outfit. You look so lovely ! I love this patterns ! This looks awesome, I love that shirt, and your shoes! For reals? Wow can't wait for you yo post all the dets about the Dalai Lama at your school, once in a life time event! 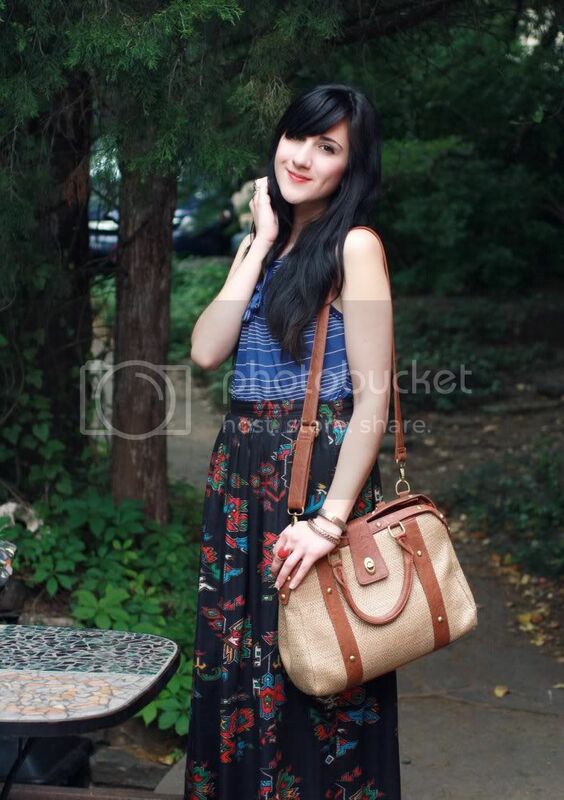 ... Loving the print on that skirt and the bag! Lovin the skirt!!! Check out my blog!!! i follow back!!! woah, those pictures look really pretty! love the one with the greeny trees behind you, totally flattering your outfit. you look great! 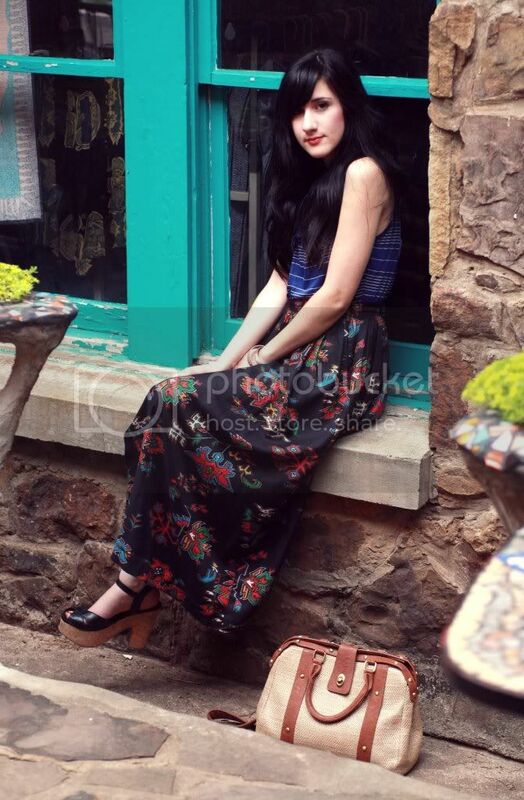 so in love with that skirt, and the cafe looks really beautiful from what i can see. also, lucky you! i am sure the talk will be amazing. one of my fave outfits of yours! that's so exciting that the dalai lama is coming to your school - wow! Which coffee shop is this, Bonnie? Is it Little Bread Company or HBK Cafe? You, my dear, are just too lovely. You've styled a few maxi looks lately that almost make me want to give it a try ;=p I am in love with this skirt on you too - perfect. Your obsession with skirts is perfectly fine with me, hehe! I love it. :D And the mixing of prints! And whoa whoa whoa, THE DALAI LAMA? That is insane! I'm sure it will be such a fantastic experience! Great Styling! Dalai Lama? very cool! Have fun! thats the best skirt ever!!! It's oh so easy to see why you love maxi length dresses: they look just smashing on you! You are are true beauty. I AM IN LOVE WITH THIS OUTFIT! very inspirational...tomorrow im going to mix prints for once in my life! As soon as I saw this, I was like "Little Bread Co!". Ugh, let's go get coffee and bagels there before you leave! You're so adorable. this is so pretty! i love that skirt, the print is really unique. LOVE this! That skirt is so fun! and WOAH the Dalai Lama...that is so cool! You are such a doll! Spot on, lady. You are too cute! Your almost gonna be here in Philly! EEEP! that coffee shop looks so romantic. i love the vintage vibe it gives off. your outfit also rocks. i think this might be my very favourite outfit put together by you. loooove! This skirt is wonderful, i love that pattern. Loving all your long flowy maxi skirts! Love that you are constantly experimenting with your looks! Putting those two prints together = genius. Always such a cutie pie! I follow u! Hope you follow me too! wow love this skirt and I love how you paired it with a different color shirt (not just plain white : ) you're always such incredible style inspiration. take good mental notes for us, that is sooo exciting! following you, hope you follow back ?? This skirt is so beautiful! If you are ever wanting to "rid" of it, send it this way! hehe. These shots are amazing too and some of my favorites of you in a while. 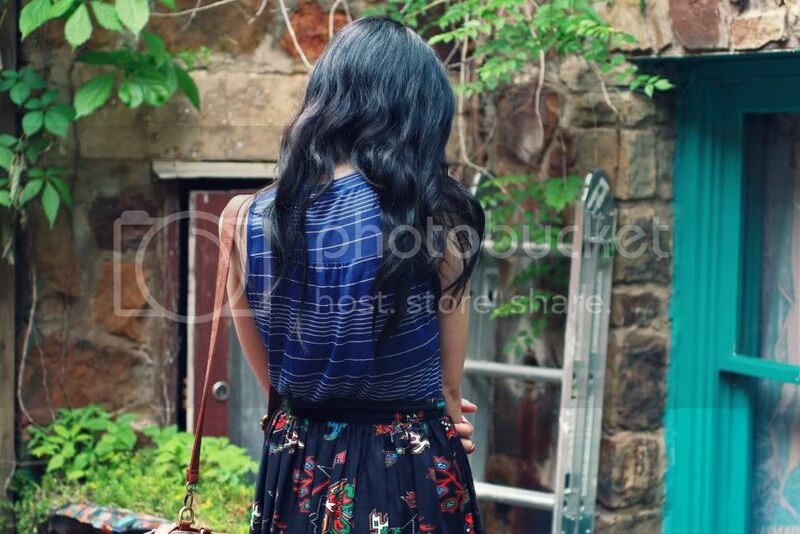 I like too the long skirt and I wear it on my blog today!! Go to see it if you want and give me your opinion! Can I be you for a day? wow, that skirt is to die for!!! That skirt! I WANT IT! if i had that skirt, id wear them even in my sleep! I love your style so much and I hope it's ok if I write about your blog and place some pictures (ofcourse with credits) on my blog. Gorgeous, love these mix of prints, and I'm with ya-obsessed with maxi & midi skirts! You look so pretty in these photos, and I am really loving those shoes! I just bought a floral print headwrap! I love this look- great clashes of prints! That's awesome! Your skirt is just too adorable! I can see why you love these longer skirts, they look amazing on you! i simply love your skirt..
the pattern is gorgeous...love it!! Love those shoes... Whenever you would like to contribute to my blog :D have a look!